Excellent performance on the road and light off-road use. 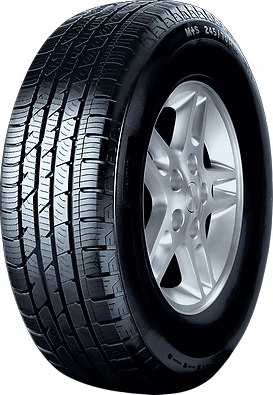 The tyre provides good handling and braking properties even on easy terrain. The tyre boasts very good aquaplaning resistance and its design prevents stone from getting caught. Thanks to its sidewall design, the tyre offers precise steering response and very good straight-line performance while rolling very smoothly and quietly. In its 04/2006 issue, the magazine ’Auto Bild alles allrad’ tested the size 235/65 R 17 108 H.
Rating for the ContiCrossContact LX: "Exemplary"
Evaluation: "Balanced handling characteristics with high steering precision on dry asphalt, low rolling resistance, high aquaplaning reserves."